The first waterfall we visited was the spectacular Wailua Falls. 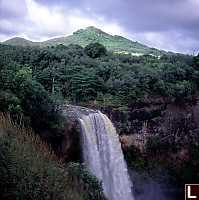 The waterfalls are a short drive from Lihue (the capitol of the island) through the sugar cane fields. There is a small parking lot at the falls which fluctuates between very busy (tour bus there) and pretty quite (tour bus gone). Having seen other pictures of the falls, it seems the water flow changes quite a bit and we saw it at it's maximum. Our next view came at Opaekaa Falls - though less spectacular than Wailua, it has a understated charm of it's own. I imagine that most of the rain forest waterfalls on the island look like this one. It's probably not a coincidence that the Hauola O' Honaunau is located within walking distance of Opaekaa Falls. The grass fields around the Heiau are planted with Palm trees. Seeing as palms propagate by dropping coconuts, I doubt they normally grow this high up - but they were well maintained, and looked great in the setting sun.